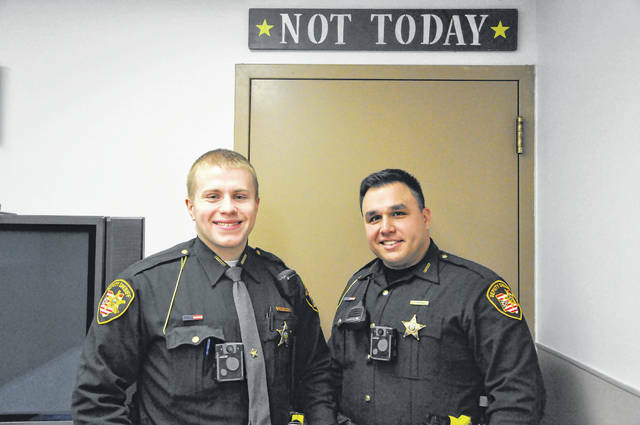 Delaware County Sheriff’s Deputies Josh Bender, left, and Steve Ridenour, right, saved a man’s life when they discovered his vehicle off the road on New Year’s Eve. Troopers believe Lebanon resident Roscoe H. Brown Jr. swerved on the road to miss a deer while driving along State Route 61 in Berkshire Township and crashed his SUV on Dec. 31. He is still hospitalized. While most Delaware County residents were relaxing at New Year’s Eve parties on the evening on Dec. 31, a Delaware County sheriff’s deputy responded to a call about a dead deer in the roadway that would end with law enforcement and medics saving a man’s life. Deputy Josh Bender said Tuesday that he got the call around 8 p.m. on New Year’s Eve. He said calls about deer in the roadway are fairly common in fall and winter. When Bender arrived at the scene on State Route 61 in Berkshire Township, he found what remained of the deer scattered all over the roadway. Bender said he called another deputy, Deputy Steve Ridenour, to assist him in clearing the deer off the roadway in a reasonable amount of time. Bender explained that dead deer can typically just be dragged off the roadway, but because this scene was so messy there were numerous pieces that had to be removed from the road. Ridenour said it was already dark at that time of night and about minus-10 degrees with the wind chill when he began walking along the road looking for a vehicle. “I noticed some track marks in the snow and back onto the road and then off the road into a treeline,” Ridenour said. He estimated he was about 60 yards away from the initial scene and saw a vehicle with its lights off, crashed into a tree. Bender said he and Ridenour called a medic while speaking to the man in the vehicle to try and gauge his condition. Bender said the man was in and out of consciousness. Medics arrived a few minutes later. The man, 69-year-old Roscoe H. Brown Jr. from Lebanon, Ohio, was transported to Grant Medical Center in Columbus with incapacitating injuries. Brown was reportedly still in the hospital as of Tuesday. Bender praised the medics, who climbed down a steep five-foot drop in the ice to retrieve the man. The deputies said no one is sure how long Brown had been out there, but it was so cold outside the the vehicle’s engine block was completely cold. The patrol is still investigating the crash. Ridenour said he didn’t really think that much of the call until later in the evening. “After the fact is when I really started to think about what would have happened if we just pulled the deer off the road and drove away,” Ridenour said.